Special Rate for February only $100! 20 SPOTS AVAILABLE FREE CLASS FOR THE FIRST FIVE RETURNING STUDENTS! Please RSVP and confirm your spot if you’re going to attend the class! 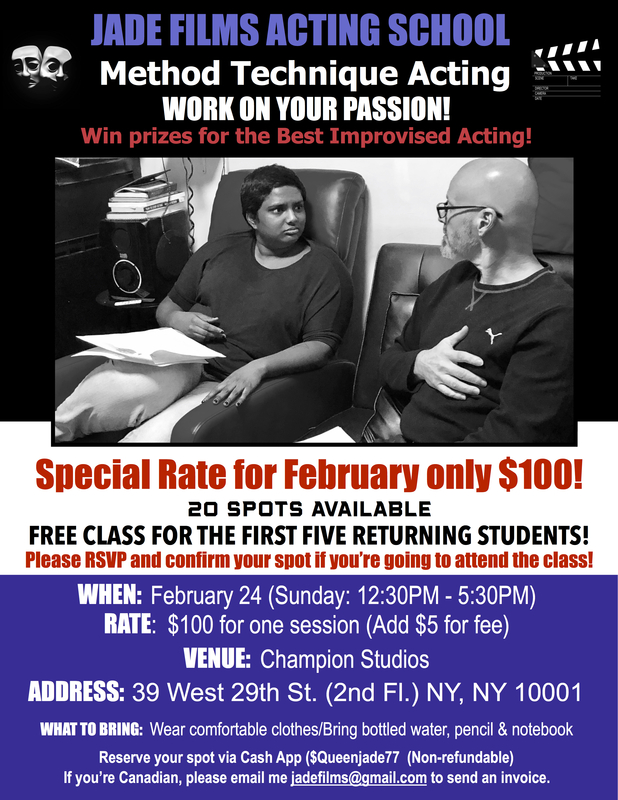 WHEN: February 24 (Sunday: 12:30PM - 5:30PM) RATE: $100 for one session (Add $5 for fee) VENUE: Champion Studios ADDRESS: 39 West 29th St. (2nd Fl.) NY, NY 10001 WHAT TO BRING: Wear comfortable clothes/Bring bottled water, pencil & notebook Reserve your spot via Cash App ($Queenjade77 (Non-refundable) If you’re Canadian, please email me jadefilms@gmail.com to send an invoice.